EDITOR’S NOTE: On Sept. 4, a PP Blog reader who understands Portuguese posted a link to a Globo.com story that confirms from a medical source that Carlos Costa suffered a heart attack on Sept. 2 and is being treated at Meridional Hospital in Cariacica in the state of Espírito Santo. Here is a link in Portuguese to that story. The PP Blog’s earlier story is below . . .
1st Update 11:46 p.m. (Sept. 2) EDT U.S.A. There are reports that Brazil-based TelexFree figure and candidate for political office Carlos Costa suffered a heart attack and was taken to a hospital today. The PP Blog cannot independently confirm the reports, but has observed a video of Costa in what appears to be a hospital room. 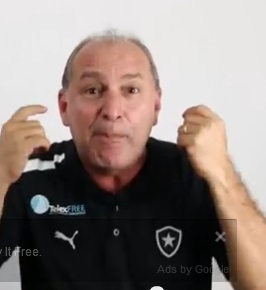 Costa gives the “thumbs up” sign in the video, which is accessible via Facebook. At the time of this PP Blog post, the Facebook post showing Costa in a hospital room reads, “6 hours ago.” The video lasts 13 seconds, and shows Costa speaking while clad in a green gown. If our reading of the situation is correct, Costa’s campaign is advising his followers that the candidate will be off the campaign trail at least until Sept. 8. TelexFree is alleged in the United States to be a Ponzi- and pyramid scheme that gathered more than $1.2 billion. Federal police in Brazil conducted TelexFree-related raids in July. Some TelexFree affiliates in the United States have accused Costa of racketeering. The Costa campaign now is calling their man “Braveheart,” apparently comparing him to the Mel Gibson portrayal of William Wallace, the Scottish warrior. Costa, wired with heart-monitoring medical devices, appears now to have delivered a bare-chested speech from his hospital bed. I am not familiar enough with Brazilian politics to assess whether this will “work” there. It is indeed confirmed. He underwent a catheterization and the doctor recommended him 5 days to rest, so this period he’ll be away from the political campaign. This is from a journal located in his city Vitoria, confirming the catheterization (‘cateterismo’ in Portuguese). DMPontes: It is indeed confirmed. I think it probably true that he had a heart attack, but haven’t seen a confirmation from a medical source. The only source so far appears to be the campaign. If you see an account in Brazilian media that quotes a Costa doctor or healthcare professional confirming the heart attack and follow up care, please post a link here. Maybe an enterprising Brazilian reporter can confirm the campaign’s story through the treating physician/healthcare professional. PatrickPretty.com: Maybe an enterprising Brazilian reporter can confirm the campaign’s story through the treating physician/healthcare professional. Or maybe the Costa campaign could make a doctor/healthcare professional available to the Brazilian media to comment on his medical condition. Privacy, of course, is a concern — which is why the campaign’s idea to show videos of him hooked up to monitors and such and making sickroom remarks while possibly under the influence of medicine might not be a keen idea. A week without major new facts. Nothing spectacular. Now we have an interesting subject. This attack Heart Carlos Costa does not convince me. A man who is able to create a giant ponzi not surprise me if forge a health problem, to raise awareness. And knowing this country as I do, do not miss witnesses nor doctors nor false documents that would claim such a heart attack. Completing the information, the G1 report has the medical bulletin. The bulletin says he is in the ICU, with no expectation of discharge, and his health condition is stable. The information was passed by Meridional hospital. DMPontes: Completing the information, the G1 report has the medical bulletin. Thanks for this, DMPontes. I updated the story above and put a link to the Globo story in the Editor’s Note. Hi, there’s a new video released from Costa.